On April 30, 1789, George Washington was inaugurated as the first Pre sident in a ceremony at Federal Hall in New York City. The chairs used at America's first presidential inauguration were transitional in design, incorporating classical motifs and carved elements bespeaking their origin in the early years of our Federal Republic. Our American Federal ClassicsTM Inaugural Chair is an exact replica of these historic chairs, made of the finest select South American mahogany, with oak and poplar secondary woods. 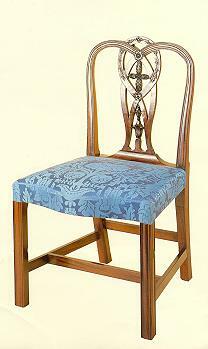 The back has an interlaced splat with carved rosettes, bellflowers and acanthus leaves. The upholstered seat has a bold serpentine front raised on square moulded legs with a stretcher base. The arm chair has knuckle arms with a shaped arm support.